With ten new additions to the team, over thirty dedicated professionals are now committed to the future of the Global Fine Art Awards (GFAA) program and its mission to develop interest and passion for fine art, give recognition each year to excellence in curated exhibitions and further GFAA’s educational role in society. What caught my interest in GFAA is its focus on true excellence in the art industry. The GFAA are to the global visual arts community what the Academy Awards are to the American film industry and will have a huge impact in keeping this excellence alive. The Global Fine Art Award team, with extensive experience in art, academia, technology and business, represents a truly global perspective, with members’ sixteen different nationalities spanning four continents. Among the key additions to the team are Dr. James M. Bradburne and Lawrence M. Shindell. New GFAA judge Dr. James M. Bradburne is Director General of the Pinacoteca di Brera and the Biblioteca Braidense in Milan. Bradburne is an Anglo-Canadian architect, designer and museologist. Educated in Canada and in England, graduating in architecture at the Architectural Association, he received his doctorate in museology from the University of Amsterdam. Over the past thirty years he has produced exhibitions and organised research projects and conferences for UNESCO, national governments, private foundations and museums. 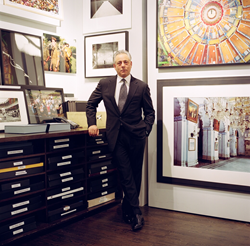 From 2006 until March 2015, Bradburne was the director general of the Fondazione Palazzo Strozzi, twice nominated for GFAA awards, winning last year for the exhibition he curated, Power and Pathos, shared with the J. Paul Getty Museum in Los Angeles. He is also one of the founders of Circles Squared, an American non-profit foundation dedicated to educational innovation in museums. New GFAA advisory board member Lawrence M. Shindell is Chairman of ARIS Title Insurance Corporation, the title insurer to the global art industry, a division of NASDAQ‐traded Argo Group (AGII). New York-based Shindell is a lawyer by profession, and holds licenses in a number of U.S. jurisdictions including admission to the Bar of the Supreme Court of the United States. He regularly advises, speaks and writes internationally on the legal title risks inherent in the global art and collectibles market for a range of industry stakeholders including the institutional commercial, not‐for‐profit, audit‐accountancy, legal advisory, financial services, D&O/E&O insurance and private equity and alternative asset investment fund sectors. Shindell has guided ARIS in support of a number of international initiatives aimed at improving the integrity of the art industry and protecting cultural legacy including the Global Center of Innovation for the i2M Standards based at the University at Albany, State University of New York, the Authentication in Art initiative based at The Hague, the Netherlands, and the Artist-Endowed Foundations Initiative of the Aspen Institute. Two of the original GFAA judges have joined the Advisory Board, Fine Art Connoisseur magazine’s Editor in Chief Peter Trippi and Cathy Leff, former Director of FIU-Wolfsonian. Jeremy Mikolajczak, former Executive Director of Miami Dade College’s Museum & Galleries of Art + Design (GFAA’s educational partner), recently appointed CEO Tucson Museum of Art, also joins the Board. Bonnie Emilius, Education and Healthcare Administration professional joins the Leadership Team as Chair of the Art Liaison Committee. Also serving on that committee are Munich-based art collectors Gernot Schussmann, and Alex Wuchterl. Educational partner, FIU’s Jacek Kolasinski, Department Chair of Art and Art History also joins. Brazilian Felipe Gehrke, winner of the GFAA Global Design Award, designer of the new corporate identity, is now part of the creative design team. The team also welcomes four interns, Miami-based Jenna Agres, and London-based Dahee Lim from Korea, Stephanie Wong She Wei from Hong Kong and Hayley Skues. The Global Fine Art Awards program mission is to develop interest and passion for fine art, and further its educational role in society. GFAA is the first annual program ever created to recognize the best curated art and design exhibitions worldwide- in museums, galleries, art fairs and biennials, as well as public installations. The award criteria are excellence and innovation in design, historical context, educational value, and public appeal. For eligibility in the 2016 edition, each nominated work was opened between Aug 1, 2015 and Jul 31, 2016. In 2016, GFAA judges will select winners in the following award 11 categories: Contemporary and Post-War (solo artist and group/theme exhibition); Impressionist and Modern (solo artist and group/theme exhibition); Renaissance, Baroque, Old Masters and Dynasties (solo artist and group/theme exhibition); Ancient Art; Photography; Design; Fringe; Public or Outdoor Installation. “Youniversal,” the final award, recognizes the most popular nominee, and is selected by public voting on the GFAA website and social media. 2016 Nominees will be announced in October. The international judges’ panel includes: Dean Phelus, American Alliance of Museums’ Senior Director of Leadership Programs; Dr. James Bradburne, Director General of the Pinacoteca di Brera and the Biblioteca Braidense, Milan; Gina Costa, Art historian and curator, previously from the Metropolitan Museum of Art and the Art Institute of Chicago; and Dr. Barbara Aust-Wegemund, International lecturer, art history consultant and curator. Leadership: Bonnie Emilius, Renee Farina, Hogan Fritz, Felipe Gehrke, Ivonn Goihman, Danny Gonzalez, America Jimenez de Lara, Liz Manners, Betsie Piussan, Nancy Richmond. Advisory Board: Tiffany Chestler, Peter Hansen, Jacek Kolasinski, Patricia Lannes, Cathy Leff, Jeremy Mikolajczak, Ty Murphy, Terry Riley, Gernot Schussmann, Hedva Ser, Lawrence Shindell, Peter Trippi, Alex Wuchterl and Juan Carlos Zaldivar. GFAA is a sponsored project of Fractured Atlas, a non-profit arts service organization. Contributions for the charitable purpose of GFAA must be payable to “Fractured Atlas” only. All contributions are tax-deductible to the extent permitted by law. Fractured Atlas, a 501(c)(3) public charity, provides a fiscal sponsorship program to help arts organizations raise money from charitable sources.